(Nanowerk Spotlight) The discovery of unique heat conduction properties of graphene in 2008 motivated numerous practically oriented studies of the use of graphene and few-layer graphene in various composites and coatings (read more: 'Cool' graphene might be ideal for thermal management in nanoelectronics). The general idea of such studies is incorporation of graphene fillers to the base, i.e. matrix, material in order to improve the resulting thermal conductivity of the composite. Certain types of such composites, termed thermal interface materials (TIMs), can be used for improving heat conduction from computer chips, light-emitting diodes, microwave sources or other devices to heat sinks. There is an increasing demand for better TIMs for heat removal in electronics and energy conversion applications. Commercially available TIMs with the thermal conductivity in the range from 0.5 W/mK to 5 W/mK no longer meet the industry requirements. 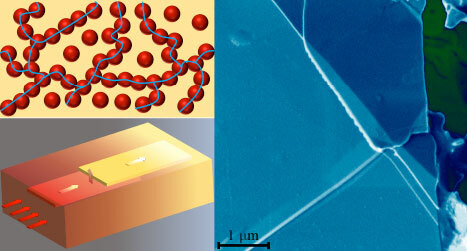 In recent work published in ACS Applied Materials and Interfaces ("Thermal percolation threshold and thermal properties of composites with high loading of graphene and boron nitride fillers"), a research team led by Dr. Alexander Balandin, Distinguished Professor at the Department of Electrical and Computer Engineering, University of California – Riverside (UCR) has demonstrated that the epoxy-based composites with a high loading fraction – up to f=45 vol.% – of the randomly oriented graphene fillers can deliver the thermal conductivity values of above 12 W/mK. This value exceeds the industry’s target, which is 10 W/mK, according to the Semiconductor Research Corporation (SRC). The UCR team has also determined that graphene composites reach a distinctive thermal percolation threshold at the loading fraction above 20 vol.%. Thermal percolation is a term used to describe formation of the continuous interconnecting network of fillers, allowing heat to travel mostly via these thermal conductive passes rather than through the matrix (see Figure 1). 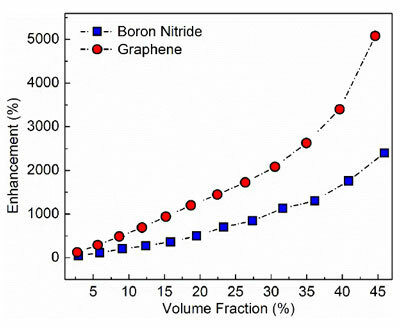 The team established that graphene fillers outperformed boron nitride fillers (h-BN) – another highly thermally conductive material – in the thermal conductivity enhancement. The reported study clarified the debated mechanism of the thermal percolation, and it is expected to facilitate the development of the next generation of the efficient TIMs. "The unexpected finding of this study was that the thermal properties of composites with the high loading of graphene are strongly influenced not only by the in-plane thermal conductivity of few-layer graphene fillers but also by their cross-plane thermal conductivity," Balandin explains to Nanowerk. "In such composites, heat mostly travels via the thermally conductive pathways of few-later graphene. As a result, heat transfer from one graphene filler to another graphene filler – across the atomic planes and interfaces – becomes the bottleneck for thermal transport." The members of the research team included Dr. Fariborz Kargar, postdoctoral researcher and the first author of the study, and doctoral students Zahra Barani, Ruben Salgado, Bishwajit Debnath, Jacob S. Lewis, and Ece Aytan. Dr. Roger Lake, Professor at the Department of Electrical and Computer Engineering assisted with the numerical modeling of the composites. The first studies of graphene composites found that even a small loading fractions of randomly oriented graphene fillers – up to f=10 vol.% – can increase the thermal conductivity of epoxy composites to about 5 W/mK, which is a factor of ×25 enhancement as compared to the thermal conductivity of epoxy itself. Most of the studies of thermal composites with graphene were limited to the relatively low loading fractions of below 10 vol.%. The latter was due to difficulties in preparation of high-loading fraction composites with a uniform dispersion of graphene fillers. The changes in viscosity and graphene filler agglomeration complicated synthesis of the consistent set of samples with the loading substantially above f=10 vol.%. The thermal conductivity achieved in such graphene composites was not sufficient for replacing TIMs with conventional fillers such as metals. The UCR team developed a new approach to composite preparation, which allowed it to increase the loading of graphene, and achieve substantially higher values of the thermal conductivity, meeting the industry’s demands (see Figure 2). "This is an important development for practical applications of graphene," says Balandin. "High values of the thermal conductivity, above 10 Watts-per-meter-per-Kelvin, can be achieved with inexpensive liquid phase exfoliated graphene. The graphene loading required for it is less than that in commercial TIMs, which have thermal conductivity below 5 Watts-per-meter-per-Kelvin. Graphene TIMs can be much better and less expensive than the conventional ones." The composites with the high loading of graphene fillers have the potential to deliver high thermal conductivity and low thermal contact resistance. Recent technological developments have demonstrated that the liquid phase exfoliated graphene can be produced inexpensively and in large quantities. Various methods of reduction of graphene oxide have also been reported. The progress in graphene synthesis makes few-layer graphene fillers practical even for the composites with the high loading. "We are now focusing on achieving the minimum thermal resistance of graphene TIMs with the surfaces of interest," adds Balandin. "This metric includes the thermal contact resistance of the composite with the surfaces and materials of interest. Other important goals are further optimization of the filler sizes and thicknesses."